Waterford is a suburb on the east side of the Logan River where it is crossed by the road from Kingston to Beenleigh. It is 7 km south-east of Logan Central. In about 1863 a ferry service across the Logan River began in the vicinity of Waterford and three years later the place was named, probably a reference to the water crossing place or to Waterford in Ireland. A school was opened in 1869. On the other side of the river, Waterford West, there was a farm settlement around the Tygum Lagoon, and the Morning Star Hotel was built there in about 1871. The Waterford local-government division was formed in 1879, the elected members meeting in the Morning Star Hotel. The town, however, did not grow, as the area was flood prone and Beenleigh attracted most trade and urban settlement. The railway from Bethania to Beaudesert (1888) ran via Waterford, but with little effect on expanding the village. In 1906 the Waterford Shire was enlarged by taking from Yeerongpilly Shire the area now known as Waterford West, Chambers Flat, Logan Reserve, Crestmead, Marsden, Browns Plains and Park Ridge. From an original area of 35 sq miles, the shire had over 130 sq miles. The post office directory (1919) recorded over 90% of farmers in Waterford / Waterford West as having German surnames. Each village had a hotel, Waterford Arms and Waterford West, and there were five blacksmiths, four wheelwrights, a store, post office, butcher and a sawmill. The 1949 directory recorded fewer than half the number of farmers, both hotels and two blacksmiths. Waterford West led the residential growth in the 1970s, and Waterford's main features are Canterbury College (1987) and a retirement village. Two primary school buildings (1871, 1888) and a play shed (1898) are listed on the Queensland heritage register. 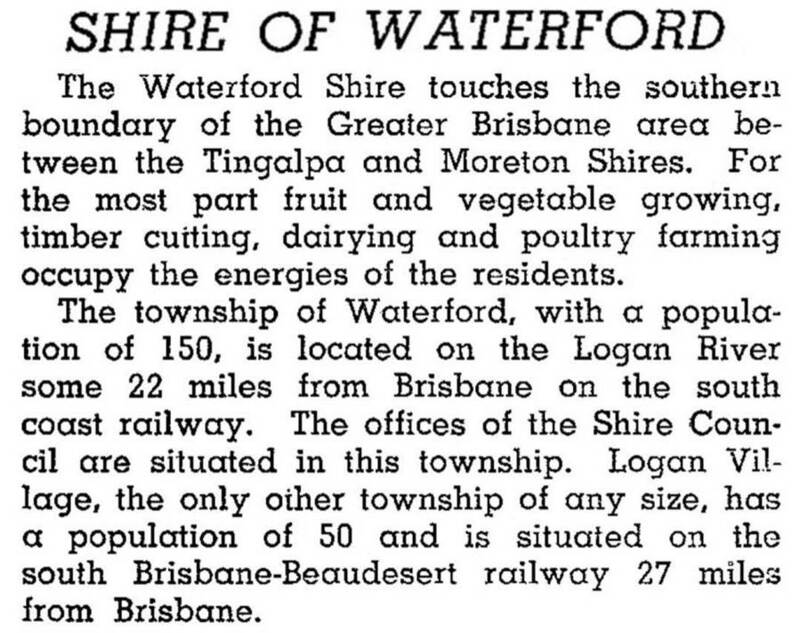 Waterford Shire was abolished in 1949, with the area once in Yeerongpilly Shire going to Beaudesert Shire and the rest going to Albert Shire. Logan Shire (1969) later took the Beaudesert areas, and in 2008 Logan City took the areas that had been in Albert Shire (Gold Coast City).